The Garage Workers' Handbooks magazine from the 1930s. Homepage. This page: Another pre-war motoring magazine, this example though is aimed at the professional garage worker. The Garage Workers' Handbooks, published in 1933. Whereas most motoring magazines I've found were aimed at the private motorist, or aspiring motorist, a few early titles were designed with traders in mind. Some were standalone issues, published either weekly or monthly, incorporating road tests, industry news, and so on. Others, such as Newnes Modern Motor Repair, and The Garage Workers' Handbooks, were published on a fortnightly then weekly basis, building up into a single set of reference material. This particular magazine dates to 1933, and would form a complete set after "about 26" parts. Quite how many were actually published isn't clear, I have a few copies, the earliest being no.1, the latest no.14, and they were all written with the mechanic and garage owner in mind. 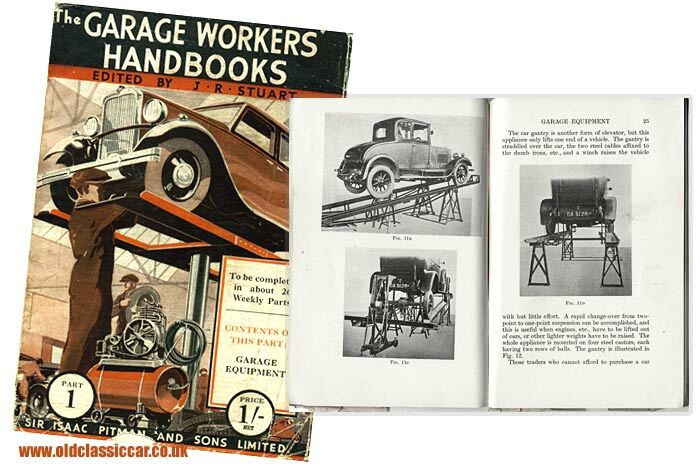 The cover of each issue features the same illustration, showing a typical motor-car repair garage of the early 1930s. All the mechanics are wearing overalls, and the de rigueur flat cap. One is working beneath a car, perhaps a Rover or a Morris, on a rotating vehicle lift, whereas another is seen carrying a car tyre, and another under the bonnet of a large car. A belt-driven air compressor is also evident, an essential bit of kit for garages both then and now. The idea was that the reader would buy a copy of this magazine each week, building up by the end of the run a complete set of literature to help with the running of his, or her, garage business. Advertisements are few and far between. The rear covers feature different adverts for Pitman books, and inside the front cover is a slightly curious advert for correspondence learning, with a chap who requests to "Let me be your father". The Bennett College offered various training courses, and advice on seeking out suitable employment at the end of study. A look at issue number 1. Issue 1 then goes on to look at the various tools you'd need to invest in. These range from jacks, petrol pumps, car lifts, engine gantries, pits, brake testers, compressors, and the tools they'd supply. One interesting section is given over to vehicle recovery, where salvage cranes to mount on breakdown lorries, towing poles and ambulances are discussed. 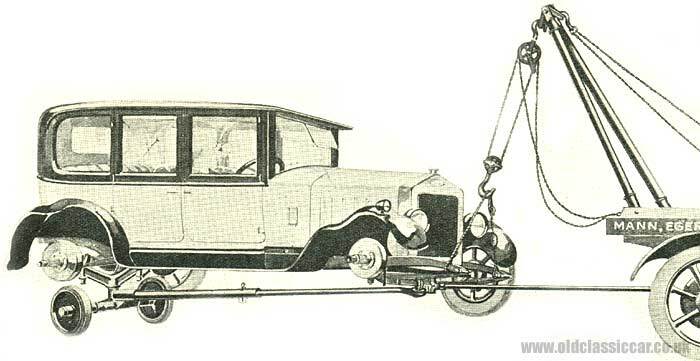 Towing ambulances were highly recommended due to their versatility, and the illustration below bears witness to this opinion. No matter how badly bent a car was, so long as it could be jacked up, chances are the ambulance could be positioned beneath the car's axles, and the vehicle recovered to the garage for repair. Future issues of The Garage Workers' Handbooks would look at different topics, all related to working at, or owning, a garage. These included workshop practices, book-keeping, carburettor tuning and related engine repair work, motor trade law, greasing and lubrication, and body repair, to name just a few of the forthcoming subjects the reader could look forward to.